Adventures In Uglyworld: Uglyworld #687 - "Real Wizards?" Uglyworld #687 - "Real Wizards? ", originally uploaded by www.bazpics.com. 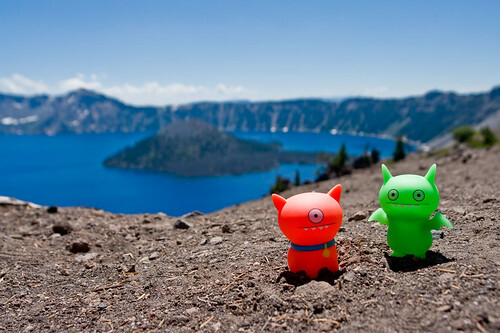 Ice-Bat and Ralf were amazed at the views they had of Wizard Island from the rim edge of Crater Lake. Ralf asked, "arf, aaaarrrr, arfles", which Icy kindly translated for me "Ralf wants to knows if the island is calleds Wizard Island becauses it's the homes of real wizards?". How could I tell them the truth and say no, I had to say yes to the pair of them, which got them into the excited state you see here.